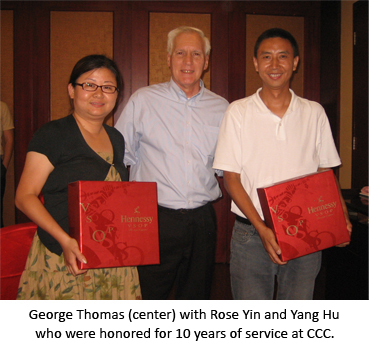 June 2012 - It is hard for us to believe that our China plant is celebrating ten years in operation. Although officially known as Contemporary Controls (Suzhou) Co. Ltd., we simply call this 1,500 sq.-m facility located in Suzhou New District (SND) "CCC". Suzhou, a 2,500 year old city located about 1 1/2 hours west of Shanghai, is the home of several foreign-owned electronic manufacturers. A majority of our suppliers are located within the greater Suzhou area. The facility opened with some fanfare on June 10, 2002, and during this month we celebrated with a company-wide dinner. During dinner two people – Yang Hu and Rose Yin – received special recognition as being employed since the day of our opening ceremony. The concept of establishing a business presence in China began in 1997 with a trade mission to several Chinese cities sponsored by the World Trade Center Chicago. George Thomas, president of Contemporary Controls, participated in this mission but postponed any decision on China until after the United Kingdom subsidiary was operational. In 1999, the concept of having a Chinese presence was revisited. During 2000, the company exhibited in two trade shows sharing a stand with Standard Microsystems Corp. (SMSC) and Toyo Microsystems Corp. (TMC), both suppliers of ARCNET technology. In 2001, the company exhibited in more trade shows and opened a Representative Office (RO) in Shanghai on February 28, 2001 and hired its first employee. However, with an RO a company still cannot trade, so the company began plans for establishing a wholly-foreign owned enterprise (WFOE) and pursued site selection. The Suzhou New District (SND) was chosen and a business license was obtained on September 5, 2001. The company chose to be located in a 1500-m2 ground floor unit of a multi-tenant building that was completed in May 2002. A grand opening was held on June 10, 2002 and operations began shortly after the opening. The RO was closed in January 2003 but the office space was retained as a sales office for the Suzhou operation until the end of that year. Today CCC is more than a manufacturing plant with fully functioning sales, marketing and product engineering departments. The ISO9001 facility serves as headquarters for our Asia-Pacific (APAC) business while providing Original Design and Manufacturing (ODM) services to our customers worldwide. Two design centers – one in China and the other in the United States – cooperate on product designs from concept to production. CCC offers lead-free surface-mount-technology (SMT) primarily using Panasonic equipment. Workmanship standards are consistent with those established by the Association Connecting Electronics Industries (IPC). The facility is under Underwriters Laboratories (UL) surveillance. There are three ways to serve our customers – private labeling, original design and manufacturing, and electronic manufacturing services. Learn more about our original design and manufacturing services. 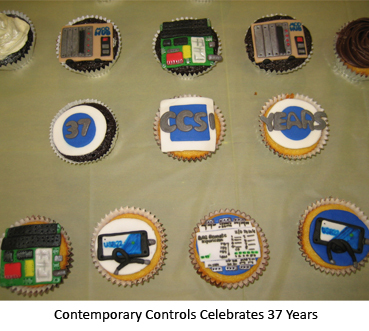 In addition to our CCC 10-year anniversary, Contemporary Controls Headquarters celebrated 37 years. George Thomas established Contemporary Controls in 1975 as a system integration and consulting business focusing on microcomputer and PLC applications. One of the first projects was the development of a microprocessor-based ratiometer for measuring the fabric stretch between pull-rolls on a cascaded AC drive system. Since that time, the company has expanded to design and manufacture products built upon open technologies such as ARCNET®, BACnet®, CAN, Modbus®, Niagara Framework® and Sedona Framework®. Our customers are systems integrators, contractors and mechanical and controls OEMs seeking simple and reliable networking and control products from a dependable source. To celebrate the 37th anniversary, Contemporary Controls hosted a staff luncheon with cupcakes provided by Stephanie Ruiz, a daughter of longtime employee Elizabeth Ruiz. "We're thankful to have so many loyal employees who are committed to Contemporary Controls," said George Thomas, president. "And the cupcakes were excellent." What is a BBMD and Why Should I Care?